Repurposing content eliminates creating content from scratch Repurposed content is taking existing content or research, creating new content and extending the life of your existing content. What do I mean by extending the life of your content? Let me give you an example. Let’s say that you are a Insurance Agent that insures small businesses and have just given a presentation on “How to Sure You are Adequately Covered for any Business Disaster” to your local chamber of commerce. Article: Rewrite the presentation by adding expert interviews and comments and submitting the article for publication into trade magazines and blogs. Podcast: Record the presentation as an podcast and add to podcast directories and upload to your site. Presentation: Turn your presentation into a Slideshare presentation and add to your site, Linkedin account, Facebook page and Slideshare. On-Demand Webinar: Record your presentation and turn it into an on-demand presentation for people to watch at their convenience. Turn the article into a webinar that your readers can view or a live webinar where members and participate and ask questions. Live Webinar: Turn the presentation into a live webinar, invite attendees and hold a Q&A afterwards. Transcripts: Have your podcasts and webinars transcribed and offer the transcriptions to your readers, attendees and newsletter subscribers. Buzz Piece: You can rewrite some of the content and turn the piece into a freebie for people who sign up for your newsletter. Series: Create a series of posts expanding on the ideas covered in your presentation. eBook: Group related blog posts and turn the posts into a free or paid eBook. If you choose a paid eBook, add some articles that you are new to the eBook. Workbook: Turn the information of the presentation into a workbook with actions tasks for your readers to complete. Press Release: create a press release letting the media know about your available presentation whether on demand or live, submit it to press release distribution sites, targeted media sites and add the press release to your blog/website media page. Infographic: Infographics are very popular right now. Create a great looking informative infographic with key information from your presentation and add it to your blog. PDF: Turn your presentation slides into a PDF for readers to download. Video: Turn your presentation into short video tutorials with screencast where viewers can watch and listen to you present the information. FAQ: Create a frequently asked question list and link to your presentation for the answers or created short videos answering questions obtained during your presentation. Contest: Run a contest offering a reward for the commenter who provides the best comment on the presentation. Comic Books: Create a comic book using the information in the presentation to create a hero villain and damsel in distress. Create a character for your business and make your business the hero of the comic book. When working in a defined niche it can become difficult coming up with new information to provide to readers. When creating material try thinking of three ways that you can repurpose the material from the very beginning. 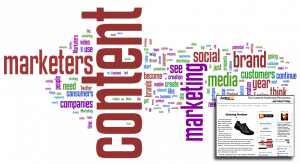 This way you are always thinking about and planning for extending the life of your content. What do you think of these ideas? Have you tried any of these ideas? Do you know of any other ways to repurpose content?